Put the kumara into a dry roasting dish and place in the oven for 45 minutes to 1 hour or until the kumara is tender. Remove from the oven and halve the kumara lengthways. Place the kumara halves side by side, flesh side up, in a warm serving dish. 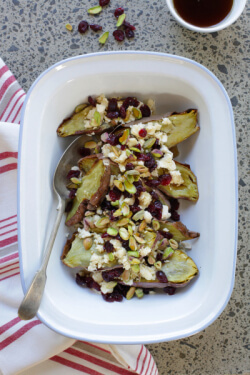 Sprinkle the cranberries and feta over the kumara. Drizzle the maple syrup over everything.